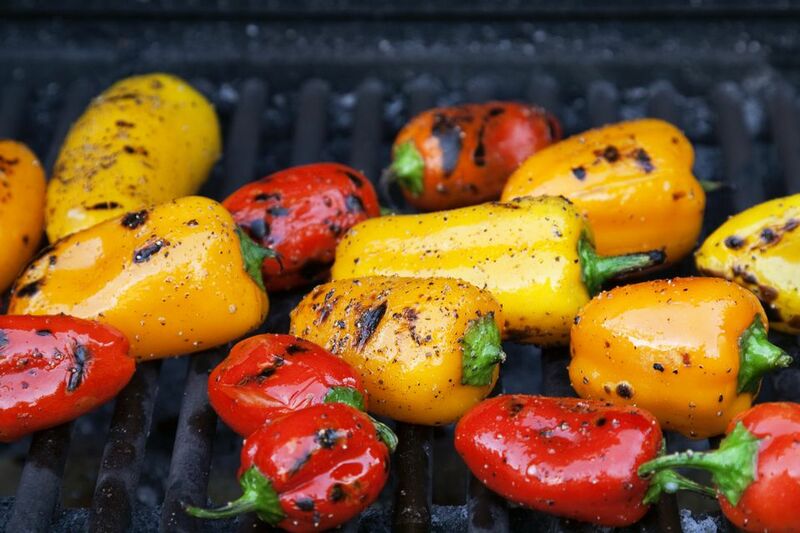 Grilled peppers, like all grilled vegetables, are beyond easy to make. This recipe works for big fat sweet bell peppers, but also other types of peppers, such as cubanelles and other longer peppers. Since this is as much a method as a recipe, feel free to grill more (or fewer) peppers as your menu, grill space, and dining companions dictate. Heat a charcoal or gas grill to medium-hot. You should be able to hold your hand about an inch above the cooking grate for 3 to 4 seconds before pulling it away from the heat. While the grill heats, you can core and halve or quarter the peppers, if you like, or grill smaller peppers whole. Brush the skin side of each piece of pepper with olive oil. Put the peppers on the grill skin-side down, cover, and cook until tender, about 10 minutes. The skin should blacken a fair amount, which is fine; it will be quite easy to slip off. Remove the grilled skin; it should slip more or less right off. Or, keep things simple and let diners do it themselves as they eat the peppers. Sprinkle the peppers with salt and serve them hot, warm, or at room temperature. Offer them whole or in large pieces with a drizzle of balsamic vinegar, or other high quality and slightly sweet vinegar (perhaps a fruit vinegar you found at a great farmers market stand). Serve them as part of a grilled vegetable platter; peppers are an excellent match with eggplant, zucchini, and tomatoes. Chop them up to add to summer salads—they are particularly good as part of a composed salad of various cooked and raw vegetables or when added to pasta salads or grain-based salads (some chopped grilled peppers are lovely added to this tabouli, for example). Use them instead of roasted peppers to make Red Pepper Pasta. Remove the skins, finely chop them, and add to scrambled eggs or tuck into an omelet. Simply add them to sandwiches of all sorts—always removing the skin first, obviously—they make a particularly hefty addition to all-vegetable salads and are very tasty when paired with hummus in a pita bread.